The opening of a £30m snow centre boasting two ski slopes and an ice-climbing wall has been pushed back. Bosses had hoped to open the Subzero centre in Middlesbrough this year after initial planning permission was granted in 2017. Developer Cool Runnings said it expects to seek full permission this summer, "with a view" to an Easter 2022 debut. Director Rachael Howson said diggers would be carrying out ground surveys at the site by the end of April. She said there was "a lot going on behind the scenes" but "a lot of it is commercially sensitive", according to the Local Democracy Reporting Service. When completed, bosses promise the centre will also include a skydive arena and trampoline park. There will also be an ice bar, cafe and restaurant, and related shops. 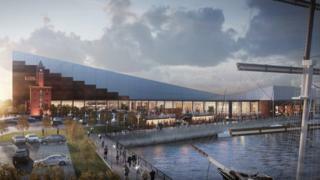 Details revealed in October depicted plans to enhance the surrounding dock area with water skiing and a surf pool. At the time, Tees Valley mayor Ben Houchen said Subzero would be a "unique addition to our sporting and cultural offering".